The Penny Hoarders Debate: Should Kids Get an Allowance? We’re intrigued by the age-old debate: Should you pay your kids an allowance? It’s a big question and a weird one for parents to tackle. 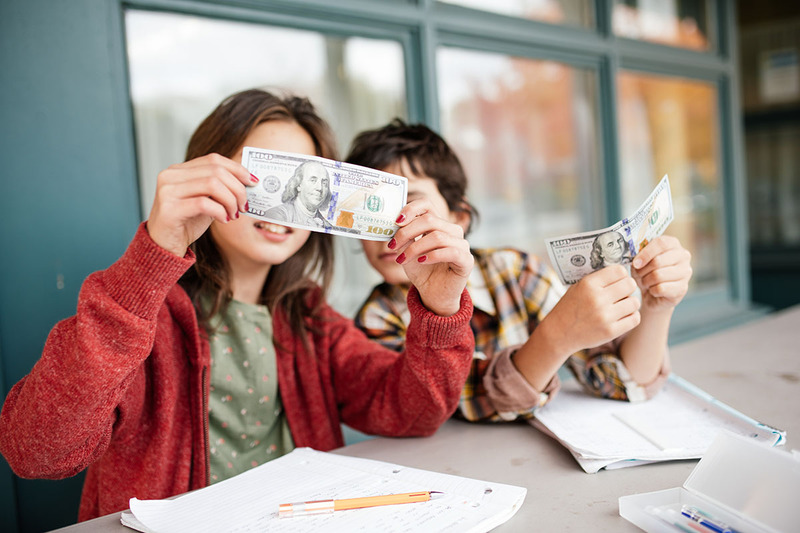 Does an allowance help teach kids about money, or does it spoil them by offering a reward for something they should do anyway? Parents have varying opinions on the subject, and no answer is right for everyone. But we enjoy the discussion! Should Kids Get an Allowance? Did You Get One? We asked TPH staffers about their experiences — and how they feel about them, years later. And, maybe more importantly: What did you do to earn it? My sisters and I earned a small allowance until we were 14, but were expected to get jobs after that. We all started with an equal jar of quarters each month. If we forgot to clean our room one day or missed another chore, my mom would remove a quarter from our jar. The kid with the most quarters at the end of the month got a $25 savings bond. I wasn’t paid an allowance, but I was paid for grades. Starting in middle school, for every A I earned, I received $50. Then in high school, my parents grew even more aggressive. In addition to the $50, I also was given $500 towards a car, which my parents saved until I was ready to buy it. My parents paid me an amount I won’t disclose (you won’t like me anymore) per A on my report card. I want to say I would have been a straight-A student anyway, but the extra motivation is probably part of why I’m so goal-oriented. I was paid a small weekly allowance to clean the kitchen table and put clean dishes away. I don’t remember doing it for too long, probably because I got jobs at my grade school (“waitress” during weekly bingo night) and church office (selling scrip — think, gift certificates — money) before I got a job in high school. I wasn’t paid an allowance as a kid. Doing chores and getting good grades were both expected obligations of living in my household, though I could do extra odd jobs for money. I sold stuff at the farmers market in elementary school, started babysitting when I was 12 and got my first real job at an ice cream store when I was 14. If I have kids, I think I’ll do something similar. Having a job outside the house taught me a lot of lessons, including the value of money, the ability to manage my time and the importance of hard work. My brother and I got $5 per week for taking out the trash, recycling and thoroughly cleaning our rooms and our bathroom each Saturday. Like dusting, vacuuming, etc. Sounds a little inflated, but it wasn’t just kicking dirty clothes into the closet and making my bed. Kids deserve an allowance. Mine will get one. Think about it: Do you really want to do all that stuff while they get to have all the fun? No way. Plus, they’ll get tired of having to work so hard cleaning their rooms and actually keep them looking nice. It’ll teach them something about earning money, organization and hard work. I just stole money from my parents. True story. Probably doesn’t apply here. I don’t remember getting an allowance. I think my parents believed helping around the house was something we should do regardless — and we shouldn’t get paid for it. They encouraged us to get little jobs here and there for as long as I can remember, so that’s how I had spending money. I did a ton of babysitting (we were required to save half of what we earned) and my brother mowed lots of our neighborhood’s lawns. My sister and I also ran a “summer camp” for neighborhood kids that was basically outdoor, group babysitting, so parents could have some time to themselves. Our girls (8 and 4) currently do not get an allowance. I do want them to, but I feel like they need to respect money first — and our 8-year-old does not. We were lax in teaching her about money. Now she’s finally (slowly) realizing it’s not disposable, but not quite at the point where I want to start forking some over to her on a weekly basis. There’s a lot of conversation involved here! My sister and I were paid a weekly allowance of $3 each for a couple of years. We alternated chores each week: Wash dishes every night, or do the laundry and a few odd cleaning tasks for the week. Eventually, my mom stopped offering the allowance on the grounds we’d just skip the chores if we weren’t worried about getting money that week. Being children, earning money was a pretty low priority. She decided we needed to learn that helping around the house was something we were supposed to do, regardless of the incentive. By the time I had a use for spending money, I started babysitting. My sister and I didn’t get an allowance or get paid for chores. My parents’ perspective was that as members of the household, we should contribute in whatever way was age-appropriate, like setting the table as a little kid, washing dishes as we got older, etc. I remember talking a lot about money, though, and comparing deals/sales/savings and which brand/size had a better price. We also did odd jobs, and we got a paper route when I was 11. My sister and I split the money to save toward our school’s grade 7 exchange trip to Quebec. I did earn an allowance as a kid: $5 a month, starting at age 8. I’d earn my allowance by doing chores: taking out the trash, helping my mother with the groceries (mostly carrying them into the house), feeding the cat and being polite to my sister. For each allowance I received — and any other cash I was gifted for that matter — I was required to give 1/3 to charity, put 1/3 into savings and spend the other 1/3 how I wanted (usually on candy). The memory is vivid because I would plan my candy purchases based off 1/3 of the earnings. Because I cherished my candy so much, I’d bring it to school as an after-lunch treat. It wasn’t long before I learned that candy had a very different value in school than it did outside, and I became the candy vendor for my third, fourth and fifth-grade classes. When I was growing up, I got a $20 weekly allowance on the condition that I did everything my mother asked me. Requests ranged from dusting every surface in my room, walking our two dogs after school, making sure my laundry was in my basket and sorted for laundry day, doing my homework immediately after school and before soccer practice, cleaning my dishes after eating and random work in the yard or around the house. If I didn’t talk back – which I was exceptionally good at as a child – she might throw in an extra $10 or $20. I did not get an allowance when I was a kid. Almost all of my friends did, and I remember being pretty bummed out it. As the legend goes, I came up with a brilliant grift at the tender age of 6 to make up for the lack of parent-given funds. I went into my mother’s treasure trove of trinkets and grabbed all of the teeth. I proceeded to pepper them under my pillow, hoping the Tooth Fairy would leave me the big bucks. It went unnoticed for a week until my mother discovered the macabre scene under my pillow as she was changing the sheets. If/when I have kids, I’ll most certainly give them an allowance. They’ll also receive a bonus for super creative/weird problem solving. Also, I will not save their baby teeth. Your Turn: Were you paid an allowance as a kid? What did it teach you — and does it affect whether you’ll pay your kids an allowance? Dana Sitar (@danasitar) is a staff writer at The Penny Hoarder. She’s written for Huffington Post, Entrepreneur.com, Writer’s Digest and more, but she’s in the market for someone who will pay her for cleaning her room as an adult.